This, the complete and unabridged original tale that provided us with the best-loved classic movie, stands on its own as a great modern fairy tale. 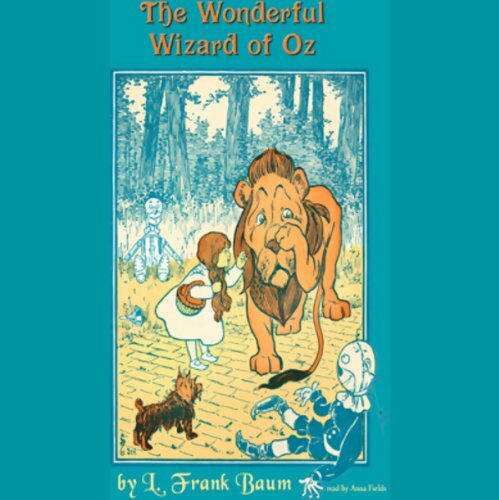 Dorothy, her dog, Toto, and her companions, the Tin Woodsman, the Scarecrow, and the Cowardly Lion, are characters who endure in the hearts of children and adults alike. Join them on their enchanting journey as they follow the Yellow Brick Road in search of the wonderful Wizard in the enchanted Emerald City. Wondrous reading of great classic! Anna Fields does a masterly job of narrating this timeless classic. She has a wonderful voice and handles characterizations well, from the wicked witches to Dorothy, the cowardly lion, the wizard and others notable characters including the mouse queen. I look forward to hearing more titles narrated by Ms. Fields, including the sequel to Wizard of Oz. Anna Fields does a fine job reading The Wonderful Wizard of Oz. Her narrator's voice is friendly and savory, and her voices for Baum's characters are suitably matched to his characterizations and sufficiently differentiated from each other, Dorothy being sweet and pure, the Scarecrow husky and kind, the Tin Woodman emotional and spunky, the Cowardly Lion deep and slow, Oz aged and apologetic and clever, the Wicked Witch of the West childish and wicked, the Queen of the Mice high-pitched and helpful, and so on. As a result, it's rather easy and fun to follow her reading even in scenes with multiple characters talking. The story itself is light-hearted, with plenty of fantastic and appealing characters (like Dorothy's companions), exciting flare-ups of violence (like the Wicked Witch sending her wolves, crows, bees, and monkeys after the party) ironic insights into human nature (like the pure Tin Woodman's mistaken belief that if he had a heart he would not need to be so careful to avoid hurting living beings because people with hearts naturally avoid hurting others), humorous lines (like when the Scarecrow asks the Lion if he has brains and he answers "I suppose so. I've never looked to see"), and good themes for children (like the idea that we all have the potential to develop the qualities we think we lack and just need to find the confidence and opportunities to use them). If you've only seen the movie, and if you like it, then you should really read or listen to the original book, because it's interesting to compare the similar and different points between them. I listened to several other versions of The Wizard of Oz, and I'm glad I chose this one, because I think it's just right. I found this book to be quite delightful. Unlike the movie, this book is appropriate for the youngest of listeners. If you have not read this book but have seen the movie, you will be amazed at all the things Hollywoodchanged. Wonderful story for all ages. Gave the book and a pair of green John Lennon style glasses as a Christmas gift to my young niece. My kids have played this book over and over. I took a chance, purchasing a classic, and I am so glad I did! I guess years of listening to more mature material made the childlike story a little to happy clappy. I found myself liking the story and then when something bad or upsetting happened to Dorothy and friends, she ends up getting out of her dire situation in less than two minutes... this drove me nuts. I'm use to there being horrible consequences and lingering effects. Instead, it's like - Bear-Tigers show up and have you against a cliff? - cut a tree, Poison flowers knock you out? - mice to the rescue, Need to pass impossible lands? - call flying monkeys, Bad witch - use water. The writer is creative for children, but it's as if every single thing Dorothy encounters, she is spoon fed an immediate solution. This all being said, I was glad it was not like the classic 1939 movie.